H. H. "Steam" Stewart: Steam Cars in New Zealand. Hector Halhead Stewart was born on April 11, 1888 in Woodville, New Zealand, the first of four children born to George Tiffin Stewart and his wife, Josephine M. O'Hanlon. George and Josephine were married on April 26, 1887. H. H. Stewart's sister Gwendoline was born in 1891, followed by two brothers, Douglas in 1893 and Lawrence in 1904. George T. Stewart's father, Dr. William Stewart, was a ship's surgeon, having been born on the Isle of Bute in Scotland on July 21, 1833. William Stewart visited New Zealand on one voyage and apparently advised his older sons to emigrate to New Zealand. William Stewart lost his wife to typhoid on his trip to New Zealand. He returned to England and went into medical practice first in London and later in his native Scotland. George T. Stewart was born in Scotland in 1862 of Scottish parents. Family tradition records that George T. Stewart at first aspired to follow his father, William Stewart, into the medical field, however upon being exposed to the operating theater, he discovered that he could not stand the sight of blood, a distinct disadvantage for a surgeon. He decided instead to join his brother John who was already in New Zealand. According to a letter in the Stewart family papers, George T. Stewart apparently left England in 1879 and arrived in New Zealand in March 1880. The trip from England to New Zealand took about three months, twelve or thirteen weeks. He was warmly welcomed by the family when he arrived. Assuming he left England in 1879, George T. Stewart was 17 years old when he arrived in New Zealand. George T. Stewart attended school and college in Scotland and England. Shortly after his arrival in New Zealand, he commenced an apprenticeship with the Ministry of Public Works and was involved in the design and drawings for bridges, wharfs, etc. He later studied for and qualified as a professional civil engineer. He designed and had constructed the first concrete road in New Zealand, a road that is still in use carrying a very heavy daily traffic load with no sign of any defects. Not bad after something approaching 100 years of service. The road is named Maskell St. and runs from St Heliers Bay Rd. through to the Glendowie district in Auckland. It is approximately one Kilometre long and is a standard two lane road with a double gradient. WHERE DID THE ROAD RUN? George T. Stewart also constructed the world's first steel reinforced single span concrete bridge over a river in the Wairarapa district about 1915 - 1917. He had great difficulty persuading his local council to approve this construction. However so convinced was he of the merit of his design that he gave council an undertaking that on completion of the project he would sit under the bridge in a rowing boat whist a full size steam traction engine with two large wagons fully laden with wool bales traveled across the bridge. The council agreed, Stewart built the bridge, and then sat beneath it in a rowing boat while a steam traction engine with two heavily loaded wagons drove over top. The bridge still stands today and is in daily use carrying a load of modern traffic. NEED PHOTOGRAPH OF BRIDGE – HISTORICAL and/or PRESENT PHOTO! PICTURE Need photograph of George T. Stewart under bridge – any other bridge photos? George T. Stewart became the County engineer in Collingwood and in October 1917, he took out a provisional patent for the centrifugal method of constructing a hollow reinforced concrete fencing post. The nature of the invention is quite brief and reads; according to the invention, "a suitable mould containing the reinforcement, is revolved at sufficient speed to allow centrifugal force to consolidate the concrete as it is fed into the mould, and so allow of the removal the casting in a short period." This method of construction was, at about the same time, developed by Walter Hume in Australia and became widely used in the manufacture of concrete water and sewer pipes. There was no connection between the two inventors and George Stewart received no financial benefit from his efforts. George T. Stewart died on November 21, 1944. Hector Halhead Stewart, the first son of George T. Stewart, was born on April 10, 1888. The Wellington College Archives contain some records of H. H. Stewart's attendance. His registration number was 1124 and his "age at joining [was] 13 years 10 months" on February 2, 1902. He had previously attended school at Kawaiwai where his highest class was "Std. V," probably something like the 5th grade in today's school systems. His parents were listed as being from Wairarapa. He left the school on May 5th, 1903 at the age of "15 years 1 month" having completed Form IV 2." His character was recorded as "a, c."
H. H. Stewart married Evelyn Constance Wakelin at St. Lukes, Greytown, on January 5th, 1915. Evelyn Constance was born in Greytown on October 20, 1889. She died in Auckland on September 10, 1996 at the age of 106. Her father was William "Shakespeare" Wakelin. H. H. Stewart and Evelyn Constance were blessed with six children. David Oliphant was born on November 15, 1915. He died on active service in the New Zealand Air Force on August 20, 1944. Keith Oliphant was born on February 23, 1917. Colin Halhead was born on July 23, 1918. He died on December 6, 1976. Hugh Douglas was born on May 16, 1920 and passed away on January 29, 2002. John Stanley Stewart, who is primarily responsible for preserving his father's archive, was born on December 6, 1925. John's middle name, Stanley, is presumably a reflection of H. H. Stewart's continuing relationship with the Stanley Motor Carriage Company at that time. Alan Godfrey was born on February 9, 1929. Evelyn Constance, H. H. Stewart's wife, was one of, if not the very first, lady motorcyclist in New Zealand. She was a nurse in the Greytown Hospital and on occasion rode a large Indian motorcycle, which belonged to one of the doctors. She also rode a Douglas that belonged to a patient. H. H. Stewart, to whom she was engaged, was not keen on her riding these large machines so he bought her a Centaur motorcycle which he felt was more appropriate. Out of 32 members of the Wairarapa Motor Cycle Club Evelyn Constance was the only female. She drove a number of very early cars including,, among others, a Crestmobile, a Holsman Buggy, and the occasional early Stanley. Strangely enough she did not continue to drive after her marriage to H. H. Stewart, and she never held a driving license. John Stewart remembered his mother clearly. "Evelyn had a pretty good understanding of motor vehicles and particularly steam cars. I think she was pretty comfortable with her husband's activities in this regard. However there must have been some frustrating and depressing times when HHS was overseas and she was left to care for 6 sons with very little income. She was a good wife and a fantastic mother who, after being widowed in 1950, lived alone for 46 years." 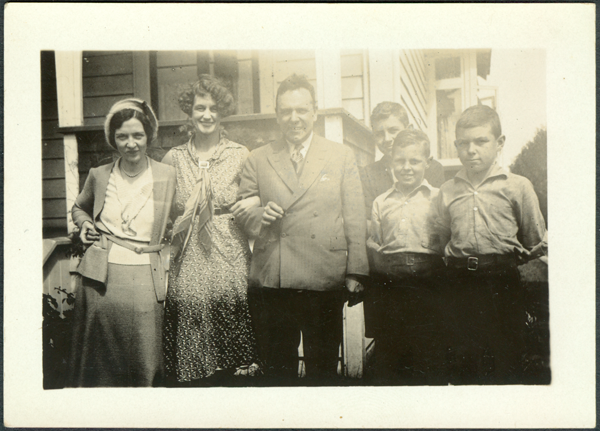 This photo of the Stewart Family was taken in late 1931 or January 1932, almost certainly by Abner Doble who is not in the photo. From left to right, Abner Doble's partner, Evelyn Stewart, H. H. Stewart, Keith Stewart, Colin Stewart, Hugh Stewart. Photo taken on the front lawn of the Matai Road, Greenlane, Auckland home of the Stewarts. 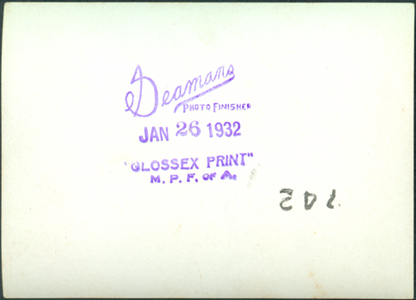 "Seamans Photo Finishers, Glozzex Print, M. P F. of A. Jan 26, 1932" on reverse. A few Stanleys and Whites which had been privately imported were also attended to. The business initially traded under the name of Stewart and Son. Later Stewarts Imperial Garage. About 1913 – 1914 H. H. Stewart and his father George T. Stewart manufactured a small number of motorcycles named the Sun. They made perhaps as few as six but maybe as many as twelve. The tires were made by George T. Stewart, and were called Boomerang Tyres, for obvious reasons. Very little is known about H.H. Stewart's motorcycles, but they apparently had two stroke, valveless, type engines made by H.H. himself. There is no knowledge of the transmission used in Stewart's motorcycles. Besides the surviving prototype engine, no other information or photographs of Stewart's motorcycles survive. The prototype engine survives in the Stewart family. It is of substantial construction and utilized Stewart's subsequently patented piston. This piston had as its special feature a conical ported top to assist with gas flow and scavenging. This apparently worked very well but would probably not be much use in today's high compression engines. This piston was patented in 1920, long after its invention. NEED Photo of Stewart prototype motorcycle engine. At the outset of hostilities in 1914, HHS. enlisted in the navy to serve in motor torpedo boats but was manpowered back out of the Navy in order to provide service facilities for the large number of Army vehicles which were established in the nearby army camp which at one stage housed about 45,000 troops destined for overseas service. In addition to vehicle servicing the business operated two Daimler Hire Cars and these did a roaring trade in transporting on-leave soldiers in to town. Not one to miss an opportunity, HHS. established a nightly (silent) movie show in the Featherstone town hall. This, along with the hire cars provided more revenue than the motor business. At the end of the war, HHS became interested in the potential of the steam car and began to research the chances of securing a Stanley agency. As it turned out, this was not too difficult but he first travelled to USA in 1919/20 to the Stanley factory to see what was offering. Elsewhere in these notes is a copy of the Stanley agency contract dated April 9, 1920 that ensued. Stewart acquired a large collection of Stanley promotional photographs and marketing cards including both the Stanley Motor Carriage Company and the Steam Vehicle Corporation of America that operated from 1924 to 1926. NEED INFORMATION ON EARLY YEARS Apprentice in steam locomotive shop During World War I, Stewart operated a taxi business, operated motion picture theaters, and had a contract to maintain army vehicles. In 1918 – Patent for Talkies perhaps in the early 1920s - move to later section? H. H. Stewart traveled extensively in his prusuit of steam vehicles and steam vehicle information. His personal papers, that now comprise the Stewart Archive, include information on the Baker Steam Motors Company, Besler Steam Airplane, the Bolsover Boiler, the Bouton Steam Car, Brooks Steam Motors Company, Coats Steam Car Company, Cruban Machine and Steel Company, Delling Motors Company, Doble Steam Motors Company, Doble-Detroit Steam Motors Company, the Lawler Steam-Mobile Company, the Standard Engineering Company, Scott-Newman, the Steam Appliance Corporation of America, and the Yorkshire Steam Wagon, as well as steam busses, and miscellaneous items. The vast majority of the information concerning H. H. Stewart and the Stewart Family comes primarily from John Stewart with the assistance of his brother Keith Stewart.